Simply One of a Kind: One layer home! 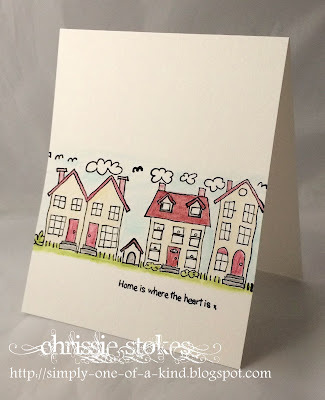 At Less is More this week it's one layer time again and the theme this week is Home. Here I used a Stampin' Up wheel. I love the style of these houses, which I coloured with watercolour pencils and blended with a water brsh.. The sentiment is from Little Claire. Here is another word wheel stamp, executed in a similar manner... once more with a Little Claire sentiment. I had to dust off my box of wheels, I had sort of forgotten about them... maybe I should give them an airing! Thanks for the inspiration Chrissie! Lovely cards Chrissy. Looks like a great challenge at LIM again. I've never heard of stamping wheels. But they do make great cards. I love the softness of the images and coloring. 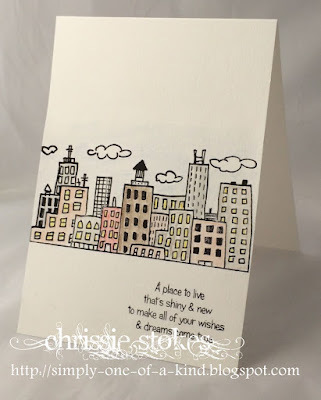 Both these cards are super cute, Chrissie!!! Never used a stamping wheel either but it looks like fun. Great cards!